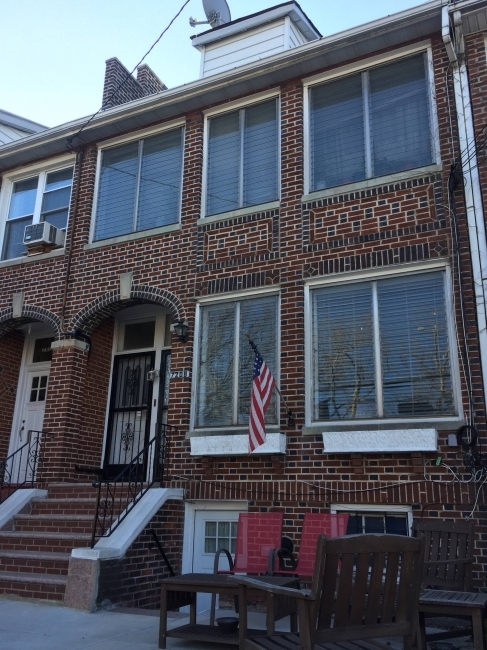 This solid, 2 family, attached, brick home features two, 2 bedroom apartments, a full finished basement, a detached, 2 car garage, lots of curb appeal and many special extras; a beautiful front porch with granite stairs and charming seating area, a small gardening patch with a fig tree in the back, and a private bbq space on the side of the home. The first floor apartment has a generously-sized sunroom, an extra large living/dining combo, a windowed kitchen with oak cabinetry, a windowed bath, 2 full-sized bedrooms and a walk-in closet. You can easily turn this lower level into a spectacular duplex, by connecting with the full finished basement, offering ample living/recreation space and potential to create the perfect owner’s oasis. Renovated just a few years ago, the sun-drenched, second floor apartment is even larger, at nearly 1300 square feet, and features gorgeous, original, hardwood floors, a windowed kitchen and bath, and 2 full-sized bedrooms. The mechanicals of the home are all updated and in excellent working condition from the 220 electric lines, redone roof, newer boiler and replacement, energy efficient windows. Perfectly located between the Shore Road waterfront and 3rd Avenue shops and restaurants, you are just steps away from all the best that Bay Ridge has to offer from the breathtaking views of the New York City skyline and Verrazano Bridge, 3rd Ave shops and restaurants, proposed ferry at the 69th St pier, Owl’s Head Park and dog run, R subway line, express bus to Manhattan and the BQE.